Echoing the issues, faced by Samsung and outlined in the previously referenced October 2015 HBR article, Design is an alluring concept for established organisations to latch onto. It may be harder to progress a design mindset or even just a design project through their organisation than they may first think. 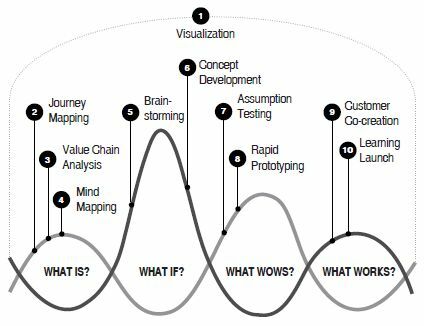 Incorporating design thinking into your search for growth is going to take some patience on your part. Most companies, however well intentioned and excited about innovation aren’t P&G or Google; they still don’t get it. Chances are that yours is one of these. I appreciate how honest this book is. Acknowledging the obstacles to embedding a design mindset in established organisations is so important. There are 10 tools outlined in the book, all of which are listed in the diagram below. Again this is a helpful toolkit for those who are new to the field of design management.